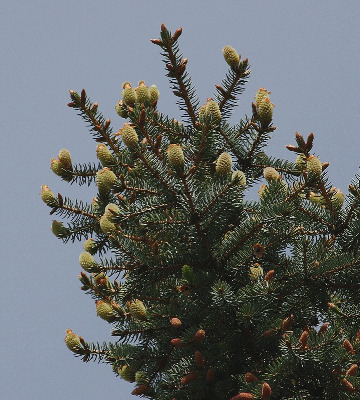 Native to the western United States, this is a commonly cultivated conifer in Michigan because of its striking blue-green foliage, especially on selected cultivars. It persists on old home sites, but was collected as a true escape by W. S. Martinus in Ottawa Co. in 2013. Picea pungens and P. glauca are both variable in how pointed the leaf apex is, and there is a small amount of overlap, but at least some leaves on P. pungens are more sharply pointed than those on P. glauca. In addition, the longest leaves of P. pungens (except on seedlings) are usually more than 2 cm, while P. glauca has the longest leaves up to 2 cm long. Cultivated (and escaped) forms of P. pungens are normally more glaucous than most P. glauca. MICHIGAN FLORA ONLINE. A. A. Reznicek, E. G. Voss, & B. S. Walters. February 2011. University of Michigan. Web. 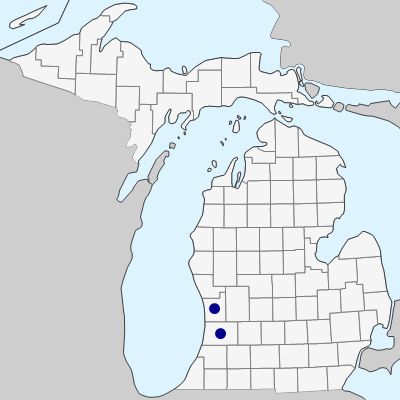 April 21, 2019. https://michiganflora.net/species.aspx?id=2902.